Photo: The yoga platform at Why Nam. Ko Pha Ngan’s spiritual pull draws yogis from all corners of the world to its pristine shores but where are the best classes on the island, and what’s involved? Here’s a selection of a few yoga schools and locations worth considering, so that you can easily choose which one is best for you and your schedule. Browse places to stay in Ko Pha Ngan on Booking.com. Book Now - Pay Only When You Stay. Perched on a hillside overlooking thick jungle and set back about one kilometre from Haad Salad, The Yoga Retreat is a wonderful place to relax and focus on your well being. Students here are often on week- or month-long retreats, and some of the classes are limited to a minimum one-week daily commitment. Three classes allow drop-ins, for a cost of 300 baht. Set by the ocean in the Seethanu area, Orion Healing Centre is ideally located for mindful yoga sessions, and offers multiple classes a day. Orion also provides longer yoga packages, teacher training and detox courses among others. See their website for full details. Drop-in is 400 baht. The three beaches of Haad Thian, Haad Yuan and Why Nam on Ko Pha Ngan’s east coast are very popular with yoga-inclined travellers. The Sanctuary on Haad Thian offers a variety of activities including thrice daily yoga classes on the rise behind the resort - drop-in costs 350 baht. Bamboo Huts on Haad Yuan is extremely popular with yoga teacher training courses, including Blooming Lotus Yoga and on Haad Why Nam there is a yoga platform on the headland where yoga sessions are held early most mornings. Last updated on 27th October, 2016. Browse our independent reviews of places to stay in and around Ko Pha Ngan. Read up on where to eat on Ko Pha Ngan. Check out our listings of things to do in and around Ko Pha Ngan. Read up on how to get to Ko Pha Ngan, or book your transport online with 12Go Asia. Do you have travel insurance yet? If not, find out why you need it. Planning on riding a scooter in Ko Pha Ngan? Please read this. Buy a SIM card for Thailand—pick it up at the airport when you arrive. Browse the web securely while travelling with TunnelBear. Try with a 7–day free trial. 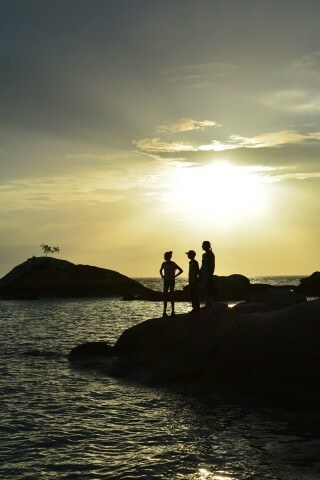 See below for more sights and activities in Ko Pha Ngan that are listed on Travelfish.org. What's a good beach on Ko Pha Ngan? Where are you planning on heading to after Ko Pha Ngan? Here are some spots commonly visited from here, or click here to see a full destination list for Thailand.